Happy Friday! Does everyone have exciting weekend plans? I have to be honest, I don't have a single thing planned, and I'm beyond thrilled. As much as I love to be busy, it's nice to have a weekend without any expectations. I'm hoping to just relax (if that's even possible with two toddlers running around), and I'm sure you'll find me wearing this midi dress all weekend. It's another great find from Forever 21, and honestly the most comfortable dress that I own. You may remember when I wore it as a layering piece here, but am excited that it's warm enough to now wear it on its own. Although I have to admit, I didn't realize how sheer the bottom of this dress was until I was editing these photos. I swear in person you could not see through it, or else Mike would of said something! The important thing is that you can't see my undergarments, so this dress will still be a summer staple. Unfortunately this exact dress is now sold out, but I linked a couple of really similar options below. I added a belt to give the dress a little more shape, and finished my look with my makeshift choker and gladiator sandals. I bought these sandals last year in both black and tan, and am so happy that Old Navy restocked them this season. At under $27 you can't beat the price, and I'm thinking I need this blue suede version. What do you think? 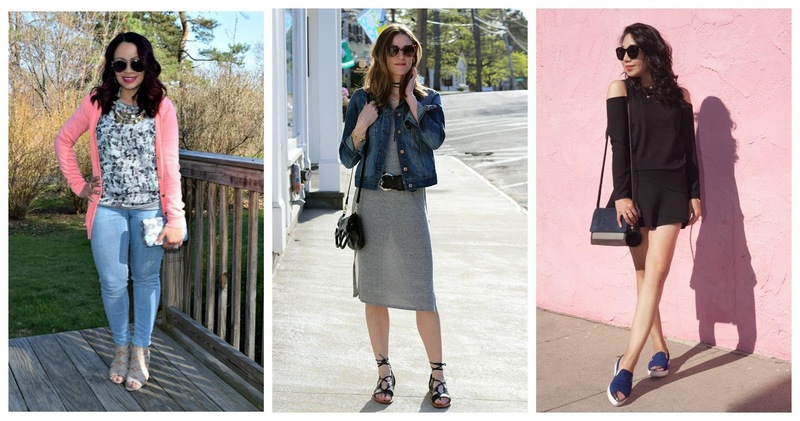 This week we have two feature bloggers of the week! Marinta of Elegant 40. How gorgeous is her red skirt? Kacie from Regally Soled. I'm loving her camo top. Can you believe that this Sunday will officially be May? This year is flying by, but I'm not mad about it, as I can't wait for summer. I just hope time slows down a little with the arrival of the warm weather. Since May is right around the corner, that also means that Mother's Day is too, so it's time to start thinking about that perfect gift. Personally, my Mother's Day is complete if I'm able to enjoy my coffee in bed while Mike takes care of the twins, but I also wouldn't mind a gift or two! I'm on the hunt for a new bag, and loving this Teddie Tote from GiGi New York. Plus, the company is offering special pricing on this bag, and free monograming until Mother's Day! Of course, what woman wouldn't want jewelry? I have this name plate bar necklace, which I never take off, and think that any piece of jewelry with one's kids name on it makes a perfect gift. Gifts of beauty also make great options, especially to those mothers trying to make their skin look better after lack of sleep, and these SK-II facial masks do wonders. 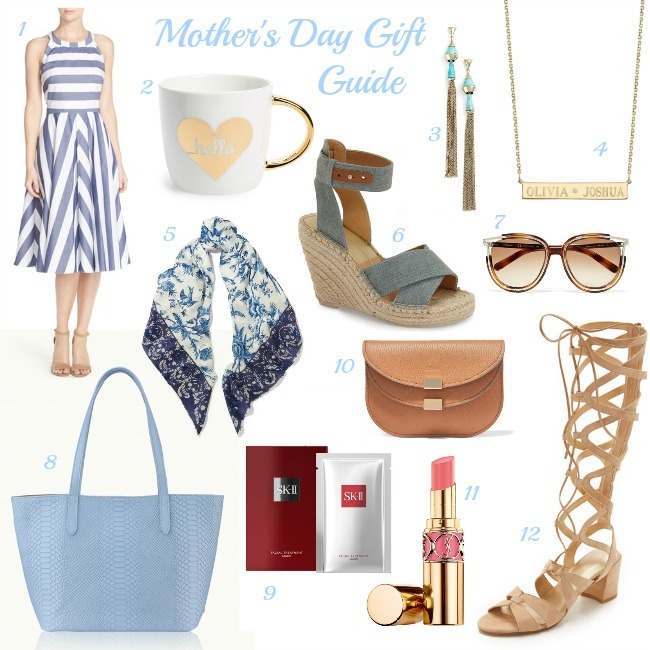 I personally love giving my mother accessories, which can easily update her look, so scarfs and sunglasses are always on the top of my giving list. It probably comes as no surprise that the saddlebag is a must have this season. Although this style has been popular for many months, they make the perfect finishing touch to all the retro and boho inspired looks this summer. In my opinion, no one makes a better saddlebag than Chloé, however these gorgeous bags are not in every one's budget (mine included). Fortunately there are so many great options out there at all different price points, and I've done the searching for you! I'm in love with this white fringe bag from Rebecca Minkoff, and how gorgeous is this blush colored Vince Camuto bag? I have to admit, I get so many compliments on my crossbody which is from Forever 21. Although it is now sold out, this bag is super similar, and I'm loving this studded crossbody option. 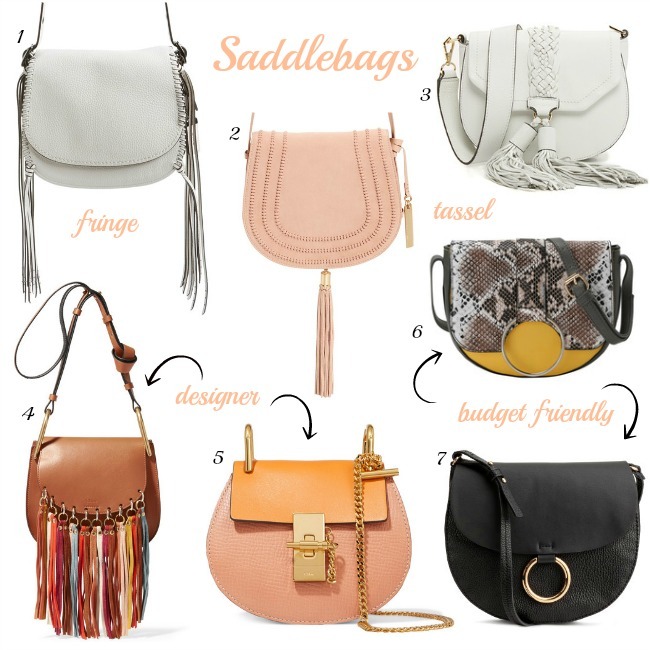 Tell me, what's your favorite saddlebag? One of the most versatile clothing items that you can add to your closet for the summer is a tunic. Not only do they look super chic as a beach cover up, but they add they perfect amount of warmth on a chilly summer night. With festival season officially here, all the boho vibes have gotten the best of me, and this crochet tunic is the perfect piece for me to channel my inner flower child. I'm loving the mix of cream and beige along with the crochet details. I paired it with my boyfriend jeans for a relaxed feel, and finished my outfit with gladiator sandals and a choker to give me my perfect Bohemian look. I can't wait for the weather to warm up so I can take it to the beach, or pair it with a pair of denim cut offs! I've been loving the look of chokers lately, and instead of buying them, I have gotten creative in making my own. 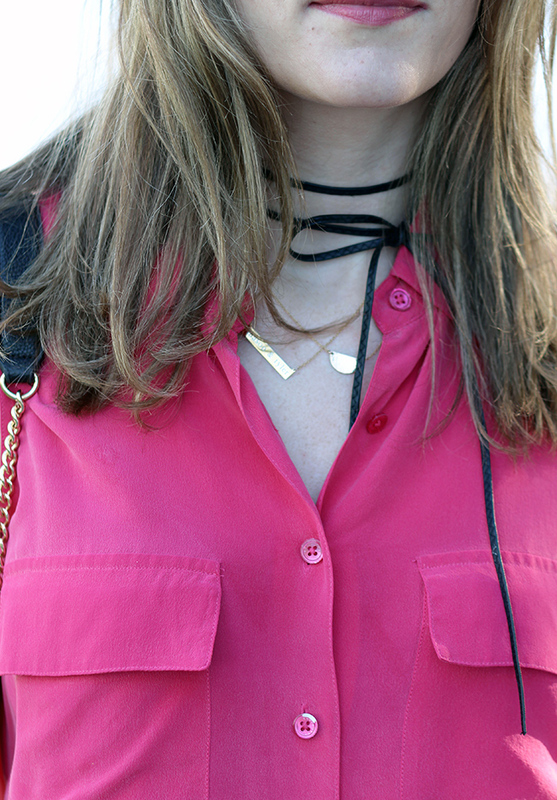 This is actually a Chan Luu wrap bracelet, which I wrapped around my neck several times to give me a choker look. 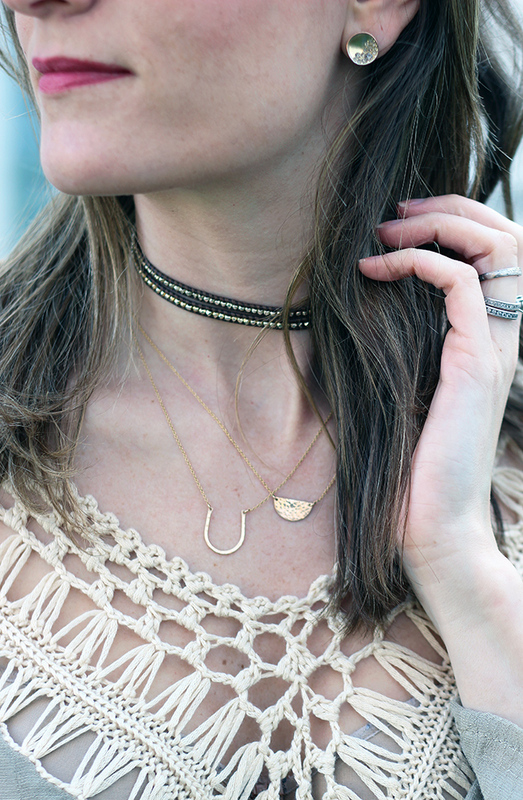 I love how it looks layered with these Lizzy Powers Design gold necklaces.